Choosing the right adapter or reducer for you exhaust system. When it comes time to repair or customize your exhaust system, exhaust pipe adapters can be a real life saver. Whether your patching a hole in a pipe, or changing sizes to accommodate a larger exhaust pipe size, exhaust adapters make the job much easier. 1.) Diameter - You need to know what sizes of exhaust pipes you are trying to connect. Most truck exhaust systems are either 3", 3.5", 4", or 5". There are some special applications where 6" or larger pipes are used, so make sure you measure your exhaust pipe size correctly. 2.) Configuration - This has to do with inside diameter (ID) and outside diameter (OD). 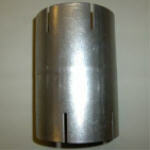 If you are connecting a 4" OD pipe to a 5" OD pipe, you will need a 4" ID to 5" ID exhaust pipe reducer. 3.) Length - Many exhaust adapters vary in length, so make sure that the reducer you select has a length that will work in your application. Union Connectors - These exhaust pipe adapters are used to connect two exhaust pipes of the same size. Normally, all union connectors are inside diameter (ID). These connectors also vary in length, so double check your application and exhaust union length before selecting. Union connectors are also available in 3", 3.5", 4", and 5" exhaust pipe sizes.